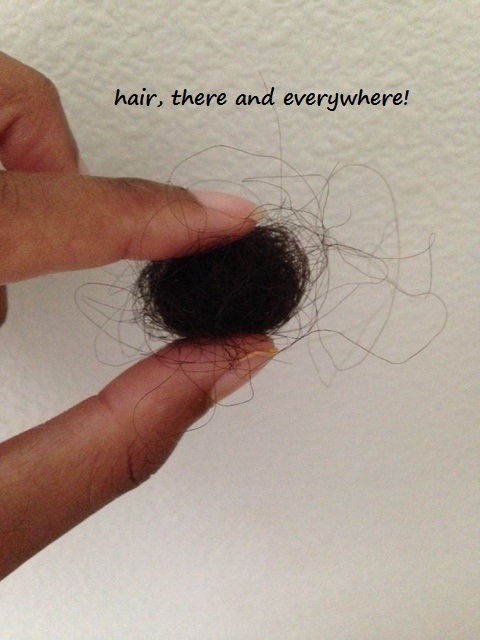 excessive shedding | hair, there and everywhere! Hi guys! It has been awhile, hasn’t it! Life has surely gotten busy around my house! Between work, work trips, and law school graduation preparation for Nathan, I just haven’t had the time (and honestly, the motivation) to blog! But during my absence, I discovered that complacency has consequences! What do I mean? Well, here I go! So for those who have’t followed me from my early days of my HHJ two years ago, I have had a relatively easy hair journey. I grew from shoulder length to the longest layers at my waist in about 26 months. I haven’t suffered a major setback. I retain length and my hair’s normal thickness quite easily. So needless to say, I just grew complacent about my hair journey and felt that no matter what I did, my hair would grow and be fine. WRONG! I have been doing everything like normal: pre-pooing, deep conditioning and moisturizing and sealing. However, I have been letting my hair faux air dry because I am too lazy to roll and sit under a dryer (who is too lazy to sit?) My hair has long let me know that it does not appreciate this method of being dried, as my hair is highly prone to tangling and breaking at the ends doing this. After weeks of having to cut tangles out of my hair and seeing my ends looking drier than hay in the middle of the barn, I decided that I have got to go back to rollersetting so that my hair is stretch out and that I can detangle and M&S on a daily basis. Now let me tell you this, rollersetting at waist length is much different than rolling at BSL. There are parts of my hair that extend farther than my hand can reach, so I have to roll sideways just to get the ends on the roller. 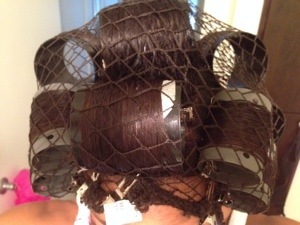 I am also using 3 inch and 2.5 inch rollers because my hair would take hours to dry with gray rollers or smaller. I will take some pictures this weekend and post. Since I have posted last, I have applied my clear glaze and dusted about .75 inches off. Also, I switched birth control pills and experienced a heavy shedding episode about two weeks ago. I learned about the impact high androgenic birth controls can have on hair loss. I have since switched back to my faithful, estrogen-filled Tri-Sprintec (ugh!) I plan on adding tea rinses to my regimen for the next few weeks, hoping that helps curb any additional shedding. 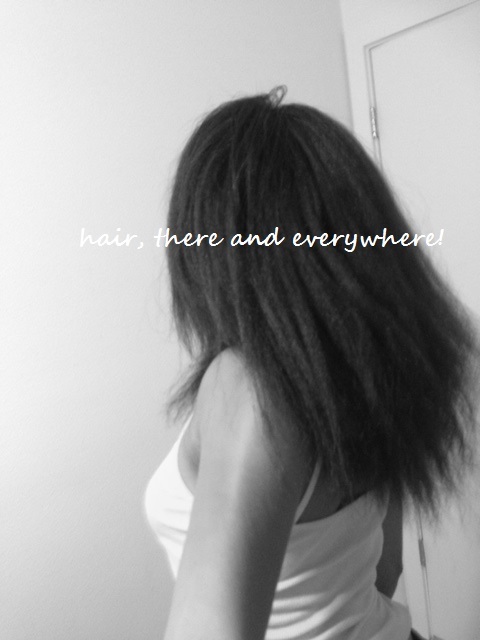 That’s all the hair news I have for now! Hope everyone is well! Wash Day and 2 Year Length Check! Greetings. I can barely muster to include my normal exclamation point. This has been some week! I started this new workout routine called Focus T25 with Shaun T and I am sore from head to toe! I could barely get out of bed yesterday morning as well as today! I had a horrible headache yesterday, probably a reaction to my body feeling like it had tetanus … it was just all locked up and stiff! I wanted to wash my hair yesterday once Nathan and I returned from the mall, but I was just to achy and tired so I figured I would do it on Sunday. Physical wise, my week has been pretty tough. Hair wise, it has been pretty good! I am living for the Carol’s Daughter Minoi Oil Sacred Strengthening Serum! I have noticed a significant decrease in broken hairs over this week. Most days, I had no breakage at all! I was able to wear my hair out on Monday and in a loose ponytail on Tuesday, but by Wednesday, it was bun time due to the workouts! I also used my Kenra Platinum Dry Shampoo one day to remove excess oil and sweat until I was able to wash again. I rolled majority of my hair using the black rollers. I took me about 40 minutes to roll. I am trying to cut my time under the dryer as much as possible! Also, I am playing around with a new recipe when I set my hair. Instead of using just water to wet my hair before each roll, I’m using water, a few drops of essential oil (choice doesn’t matter) and a few squeezes of vegetable glycerine, all mixed in my spray bottle! So far, it is good!!! The thing about the black rollers is that they leave my curls a bit flacid, if you will. I don’t get the really cute spirally curls like I do when I set on purple and gray rollers. The hair has an almost flat-ironed look. I didn’t take any pictures today, but I promise I will next week! I combed my hair into a wrap, applied a few drops of Minoi Oil and sat under the dryer for about 10 minutes, then combed out for the final evaluation. I noticed that I have had a lot of shedding this Wash Day, which is alright, considering I lost barely any hair at all during the week. I may do a black tea rinse next week and see if that helps! All-in-all, it was a good Wash Day (it was kinda long, though) and I was pleased with the results. 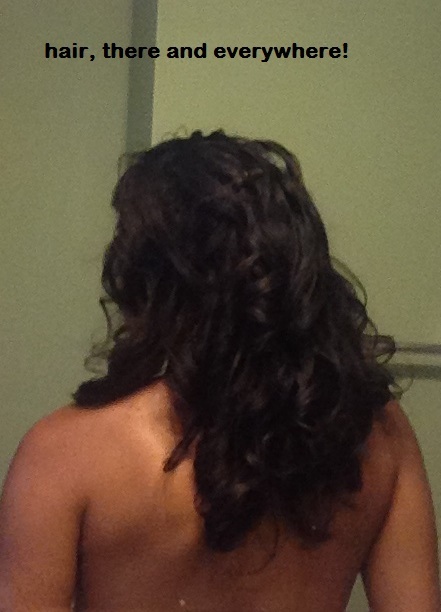 I admired my hair a bit, then rolled it back up in a modified roller set to refresh the curls. The one thing I don’t like with the black rollers is that my curls are easily combed away due to the lack of curl, so I find it very helpful to re-roll my hair dry to get back that volume and bend at the ends. 1. Eastbound and Down Season 4 returns to HBO TONIGHT!!!!!!!!!! 5. South Park is back!!!! 6. Big Bang Theory is back too!!! 7. 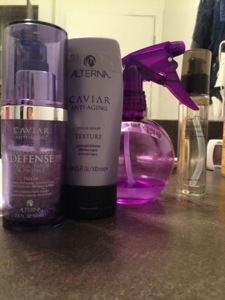 I found my Alterna Caviar Texture Cream!! Ah, my main dude, Kenny “F’in” Powers!!!!!!!!!!!!!!!! In order not to make my Relaxer Day post too long, I thought I would break these 2 posts up and give some hair updates and observations during my time in NC. 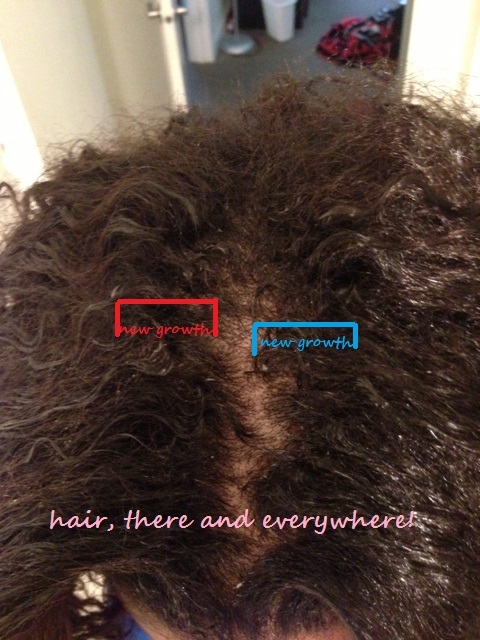 – As you may have read, the week and a half leading up to my relaxer had me shedding something crazy! I literally thought I was going to be bald (hahah!) I never attribute excessive shedding as a cause of me needing to end a relaxer stretch, but since I have relaxed my hair a week ago, the shedding has been soooooooo minimal. Like a few strands a day, even with combing. I often view relaxers as kind of a Darwin-esque mechanism. Hairs (and ends) that are weak just won’t last during a relaxer processing, so I am left with strong, robust strands, if you will! 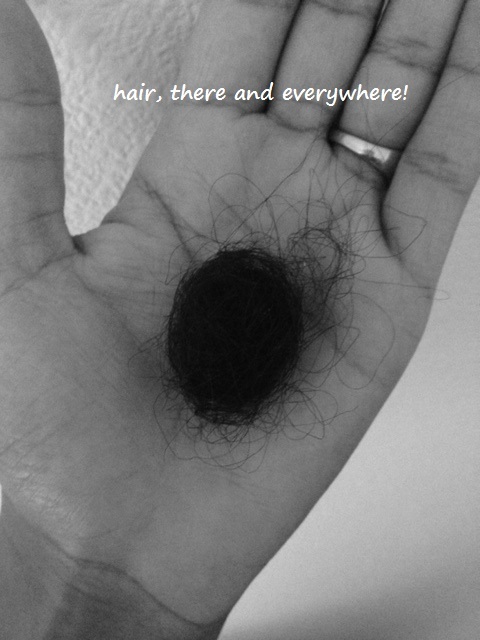 I am not sure if my new birth control kicked in some hormones or whether a change in scenery was what my hair needed, but my shedding is under control – for now! 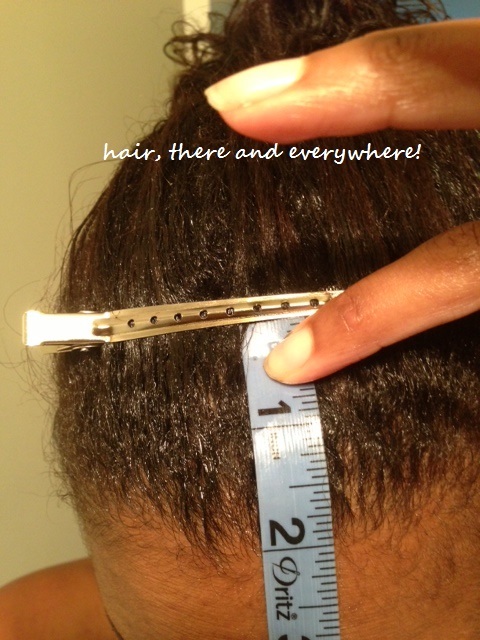 – I also experienced some breakage near the end of my relaxer stretch. I don’t think I will just blow dry my hair and not flat iron it again. I plan on roller setting my next pre-relaxer day. – I am going to have to learn my hair all over again when I move back to NC. It is soooooooooooo humid! My hair just didn’t stand a chance! I don’t think all the products in the world will stand up to the humidity in the South! I will say this, I think the Living Proof products I am using helped (see below for full list of products). Instead of my hair poofing up all wild-like and leaving me with wet, swollen, and limp hair, the curls just fell and I was able to still wear it down (not sleek … pulled back in a headband) or in a ponytail. I am so glad that I did not pay $45 for a roller set only to have the NC rain and heat come and whisk my curls (and coins) away! – I don’t like straight hair. It’s fun to have a sleek, flat ironed look sometimes, but to me, it’s gets old pretty fast and the reasons should be pretty obvious to someone on a HHJ! For one, there is too much upkeep involved to maintain it. You have to wrap (or cross-wrap), take it down, make sure there aren’t any bobby pin or clip indentations and if there are, apply heat to remove them (if you so choose). Also, if it needs to be “bumped,” you have to apply more direct heat. Then you have to watch what you’re wearing, where you go, what the forecast is looking like, etc.! It would be remiss of me not to mention that straight hair displays all your flaws. If your hemline is chewed up, it will show. If you ends are like Rice Krispies (snap, crackle and pop! ), it will show. You can hide easily hide subtle flaws with roller sets and other protective styles. Also, I like the look of voluminous curls or waves that I get from roller setting or doing the faux air-drying method. – I did a roller set two days after I got my relaxer on Labor Day. I was heading to Raleigh to meet with some friends and had to be fly! I washed my hair with some sulfate shampoo Kim had on hand to remove silicones from my flat ironing session and followed up with my Alterna Caviar Volume poo. I did a 20 minute deep-conditioning session with Ion Extreme Moisture conditioner and followed up with my Roux for 1 minute. My leave-ins were: Living Proof Prime Style Extender, Living Proof frizz Nourishing cream and Alterna Texture cream. Kim kept insisting that I use a setting lotion or foam. I said nope … water only! She rolled me up, I placed on my roller net and I went back to my mom’s house, where I had a dryer like mine waiting for me! I can’t do tabletops if I can avoid it! I sat under the dryer for about 1 hr and was so tired I couldn’t keep my eyes open so I decided to sleep in the rollers for the first time to let it air dry over night! It was a bit uncomfortable, but I was so tired, it really didn’t matter. I misted my hair the next morning and sat back under the dryer for about 30 minutes for a final setting. The curls were beautiful! I was very tempted not to blow them out in preparation for my hair to be wrapped, but I did! In hindsight, I should have left them alone and maybe the frizz wouldn’t have been so bad! By the time I got to Raleigh in the late afternoon on Tuesday, my hair had had it. It was humid, my ends were screaming for a dusting (which I did when I got to the hotel). To add insult to injury, after dinner at Second Empire (yum), we went to Solas, which is a rooftop bar! By the end of the night, my hair was in a bun! 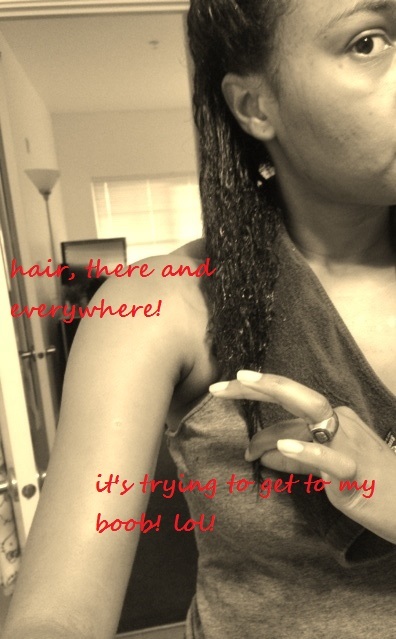 The next day, I combed and detangled it, smoothed with some Vitamin E oil and wore it down with a headband. – People touching my hair makes me very nervous. I think the longer my hair gets, the more protective of it I become. At the ratchet club we went to Saturday, I sat still in a booth and made sure people couldn’t get behind me. I was in fear that someone would try and pull or cut my hair! In my hometown, there were a few people who checked for tracks. One hairdresser told me, “I would just cut all that hair off if you came to me!” SEE? That’s why I won’t allow black people to do my trims! That almost turned my blood cold. – At Sephora in Crabtree Valley Mall, this beautiful lady with beautiful natural hair gave me some tips on how to deal with long hair and frizz! I asked her if she thought the Living Proof frizz shampoo and conditioner was good, and she said she didn’t recommend it, as even without sulfates, she found the shampoo stripping and the conditioner didn’t work well. She said she uses the Alterna Caviar shampoo and conditioner and Living Proof leave-ins (frizz Nourishing cream, Prime Style Extender and Satin Serum). I knew when she said that, she was a HHJ sister, as she even mentioned the word “journey.” She admired the thickness of my hair and ends, even though the curls had been long gone! She told me that I missed one spot when dusting (which was the very back! ), but other than that, my ends looked good! 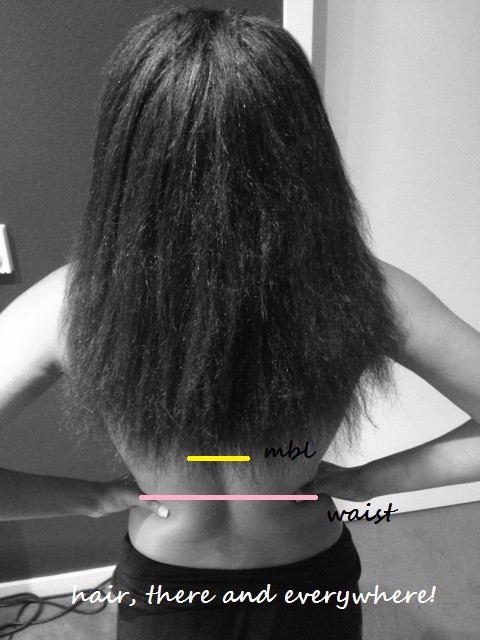 She told me she is preparing for a trim in December to remove some of her ends, but she wants to be MBL when she does it. I talked with her a good 10 minutes, sharing hair tips (I recommended she try the Hercules Sagemann rake comb) and would’ve stayed longer had my friend not come in to retrieve me! One story she told me stuck out and validated my choice not to go to this salon I was thinking about trying. She recalled a time she was at a salon and she was asking the stylist what products she was using, instructing her on how to detangle her hair, etc. and the stylist told her “Oh … you’re one of THOSE!” HA!!!!!!!!!!! I know there are great stylists out there, but I don’t want to go bald on my quest to find one! That’s why I will stick with me or my friend doing it for now! P.S. As soon as I got to some shears, I had my friend helped me get that last piece of rough hair! – My ponytails are on point! I was swanging my long ponytail the last two days I was in town! I can’t wait until I see my WL ponytail! – I don’t think I am going for full waist length. It would be just too much to deal with, IMHO. I actually like soft, subtle layers, so maybe when my length in the front hits BSL (in the year 2025), I will be happy! Today I was M&Sing my hair and noticed that the ends of my hair looked so dry! Instantly, I thought about this old song from Crucial Conflict a la 1995-96 called “Hay.” In the chorus, they say “smoking on hay in the middle of the barn … ” That’s what my ends felt like … some hay in the middle of a barn!!!!!! 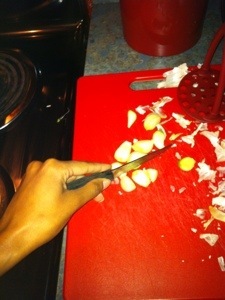 2) There was not very much breakage from the ends. My hair breaks at the first hint of dryness, so for ends not to be popping off left and right, they must not be that bad; all-in-all, I may have had 7 small broken ends today (I had 0 yesterday), so I am not too concerned! To combat further dryness, I M&Sed in 6 sections using the L-O-C method with my Alterna White Truffle Elixir as my liquid, kukui nut oil as my oil and Amla Legends 1001 Oils Night Wrap Cream as my cream. I twisted the cream onto my ends and instead of leaving my hair in a bun for the night, I wound up each of my six sessions and pinned them close to my head, hoping the heat from my head would help the product penetrate my hair a bit better and let me wake it to soft hair! 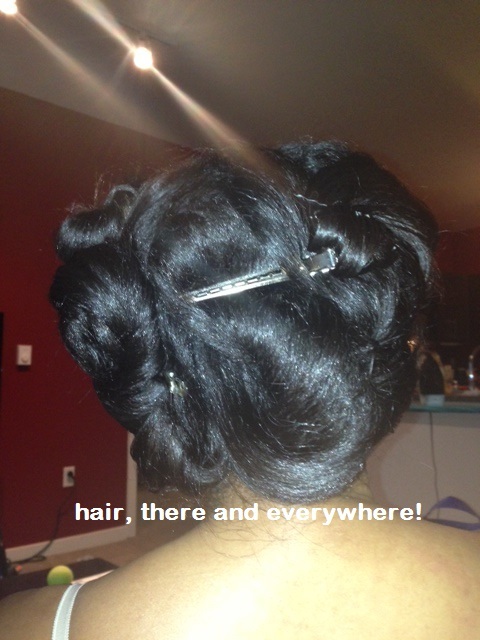 Here’s how it looked when I was finished pinning my hair up! As far as shedding goes, it hasn’t been too bad since Saturday. Yesterday evening I lost very little hairs and this is what I lost today. I checked each of them for bulbs to make sure my hair isn’t breaking heading into a relaxer. 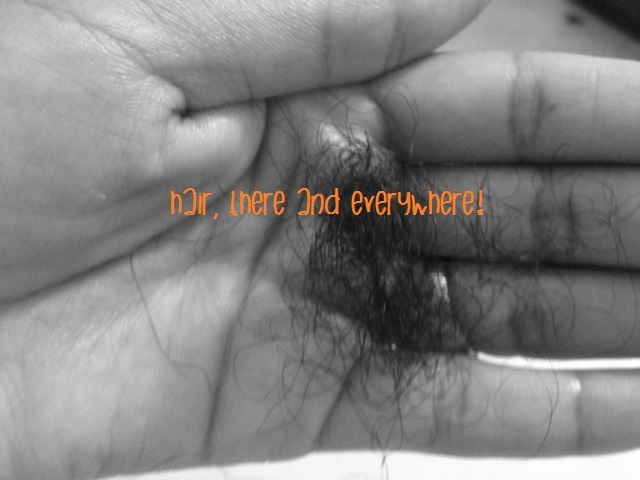 After I inspected each hair, there was 3 strands without a bulb, which could be breakage or the fact that I sometimes yank at my hemline trying to remove shed hairs and sometimes those strands break. Either way, the number was not so great that I was alarmed in any way. Here’s the hair I lost today, which is not at all excessive, even in my [tightly-wound] book! 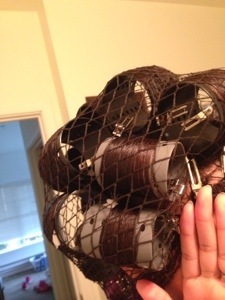 I will continue to monitor the ends of my hair and shedding volume until my relaxer on Saturday! Whoop whoop! 5 more days!!! 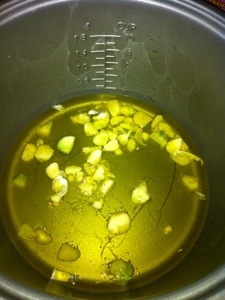 I started of with a honey, safflower oil and coconut oil pre-poo for about 25 minutes without heat. I then proceeded to cleaning step, in which I clarified my hair with Alterna Life Solutions clarifying poo, followed by a wash with Alterna Life Solutions Scalp Therapy and Alterna Caviar Volume. I then then an in-shower conditioning treatment with Redken All-Soft … all of this which is par for the course! I then proceeded to strengthen with my protein treatment, which is where things went a bit awry. 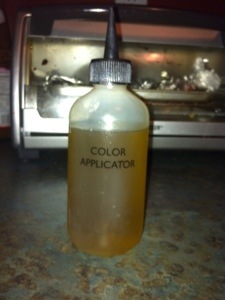 I applied my ApHogee 2 Step Protein Treatment as normal, sat under the dryer for 20 minutes, and then rinsed it out. I followed it up with slabs of Alma Legends conditioner and Silk Elements MegaSilk, as my hair was hella tangled! I learned my lesson from my February pre-relaxer wash day that is it important to detangle before you proceed to deep conditioning after doing an ApHogee 2-step protein treatment! Once I detangled my hair using those products, I put a coat of Ion Extreme Moisture cream on. 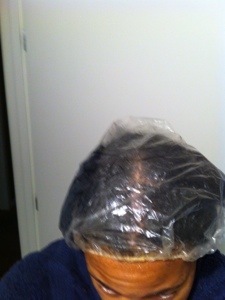 I placed a wet turban over my hair, popped on a shower cap and deep conditioned for 50 minutes. “Just as progesterone dominant BCPs can facilitate female pattern hair loss, oral contraceptives higher in estrogen can stimulate hair growth by prolonging the anagen phase of the growth cycle. A problem is that estrogen dominant birth control pills have a greater incidence of certain side effects. Your gynecologist should advise you on which BPCs should be used in your particular situation. Since I am not too concerned about the amount of hair that is shedding, I do not plan on doing any interventions for right now (e.g. 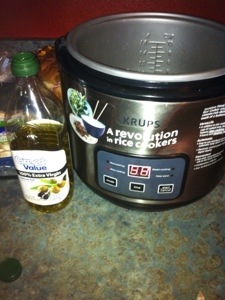 black tea rinses, garlic treatments). I also want to continue to monitor the amount of hair that I lose so I can see if this is a trend that happens as autumn nears. 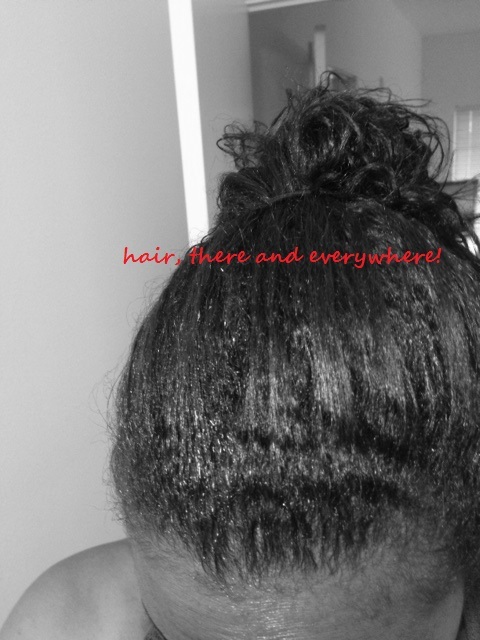 In The Science of Black Hair, Audrey Sivasothy notes that the greatest percentage of our hair is in the telogen stage (also known as the shedding state) during the late summer or early fall months. So Ok … back to Wash Day! So I rinsed out the conditioner, expecting my hair to feel soft as silk since I had slathered so much conditioner on it, but it doesn’t. It doesn’t feel hard, but it doesn’t feel like it’s normal silky self after a DC. I detangle and apply my leave-ins, as I am planning to roller set. I applied: Living Proof Restore Targeted repair cream, Living Proof Prime Style Extender and Living Proof Satin serum. For some reason, now my hair feels mushy and thin since it’s been shedding like crazy throughout each stage of this Wash Day and I am watching the ball of hair I lose grow by the second. By this point, I am convinced that my hair has lost like 3 inches of growth and that I have a bald patch somewhere. 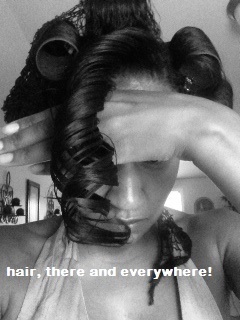 I throw 2 rollers in my hair and I am just like “Fukk this!!!! I am blow-drying my hair straight to see what the damage is.” I didn’t want any surprises when I relaxed next week to find that my hemline is now shaped like a “W” instead of my “U” and/or my hair has thinned out so much! Of course that made my HHJ-conscious angel go: “Well, if you blow dry your hair this week and then next week you will have used direct heat back-to-back, which is a major NO-NO!” My HHJ-conscious devil then went: “As angry as I am, if this hair can’t take two weeks of direct heat, then dammit, it deserves to fall out or break off because I. AM. NOT. ROLLING. NO. DAMN. HAIR. TODAY!” HINT: Devil wins! So I begin the arduous task of blow drying my hair. I have not blow dried my hair in months and it’s definitely not something I enjoy doing. I applied some Alterna Texture cream for its heat protectant properties and began to blow dry sections of my hair, starting at the nape. By the time I am in the middle of my hair, I am just done. The attachment is getting caught in my hair, despite me detangling it before I began blow-drying, the new growth won’t lay flat. I AM BEAT. 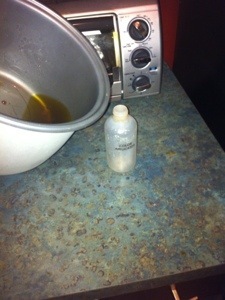 I finally finish drying my hair and apply Alterna Caviar White Truffle Elixir to the length and seal with kukui nut oil. I don’t see a lot of broken ends, just more shedded hair. I think that some of the hair just got caught in this vicious cycle of going from my head back to my comb back to my hair again before I finally removed it and put it in a pile. I knew I wasn’t going to flat iron my hair after blow drying (see HHJ-conscious angel, I comprised!!!) This week, I plan on bunning while trying to keep my hair as detangled as possible to prevent matting. First I wanted to share with you the amount of hair I lost today (pictured left) vs. the amount of hair I lost about 3 weeks ago (pictured right) during a Wash Day. See the difference? Here are some pictures of my new growth during my pre-poo. I think I am at just over 1.5 inches of new growth … the clip where I start measuring my wavy new growth may have been a little high. Here is my blow-dried, wild-looking, Mufasa-mane-like hair! Sorry it doesn’t look “polished,” but this is as good as it gets today!!!!!!!!!!!!!!!!!!!!!!!!!!!!!!!!!!!!!!!!!!!!! Also, it’s official … I am closing in on MBL! I will find out for sure next Saturday!!!!!!!!! Until next time, friends … ! P.S. I don’t think my hair likes the Living Proof Restore Targeted Repair cream, so I will not be buying it! I posted last month about how my hair had excessive shedding. It was pretty bad, in my opinion. Not only did I shed throughout the week even with my low manipulation regimen, I felt like I shed an entire kitten on 2 Wash Days in December. I did a black tea rinse about three weeks ago, but I cannot say for certainty that is what alleviated my shedding. I was reading the Science of Black Hair (I go back through the book every so often to refresh my knowledge or use it as a reference) a few weeks ago and the author stated how hair goes through more-than-normal shedding phases due to stress, hormones, etc. and I guess I was going through one of mine! I had about three of them last year in spring, late fall and early winter. Maybe mine is seasonal? Now my shedding has returned to normal. When I M&S my hair in the evening, I lose maybe 10 hairs and on Wash Days, it’s the normal amount that I lose each week. OK … isn’t this cartoon hilarious! Last Length Check of the Year!! Today was Wash Day. I have not blogged about one in a while, but since they are pretty much the same, I feel that if you have read about one of my Wash Days you have read about them all! 🙂 Today’s Wash Day was like dealing with a two-year old child throwing a tantrum. My hair did not want to cooperate with anything I did. I am exhausted as I sit under the dryer writing this! 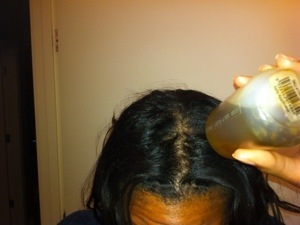 I started off with a 45 minute prepoo of Proclaim Aloe Vera hot oil on the scalp and length of hair. I also added vegetable glycerin to my hair, which has been MIA in my regimen as of late. This was a favorite prepoo ingredient this past winter due to its humectant properties and since I could definitely stand to draw a little moisture from the air into my hair, I thought it was time to revive it! I washed with Alterna Life Solutions (which is running out) and Alterna Caviar, followed up my Alterna Winter Rx Thermal Oil. I am still not feeling the “slight warmth” this product is supposed to put off, but oh well! I rinsed it out and followed up with my dynamic duo conditioning squad (hhaha! ): Alterna Caviar and Redken All-Soft. These two products have been in my line-up long before I knew what a HHJ was! I always use the Caviar, but sometimes when I want a extra boost of conditioner, I will use the All-Soft. I left it on for about 9 minutes and then rinsed with cold water. I deep conditioned with Silk Elements MegaSilk. I tried to detangle, thinking that the product would make it easier, but my hair did not want to cooperate. I could barely get the comb through. I was a bit angry, so I thought I better leave the hair alone before I ripped it out. I was like “screw it” and slapped the product on, threw on a towel and shower cap and sat under the dryer for about an hour. I rinsed it out with cold water, followed by Roux for a minute, then a final cold rinse. I put on my Caviar Photo Defense and started to detangle. It was going a lot better than it was earlier. I applied my other leave-ins without incident, but when it was time to roll my hair, I couldn’t part my hair for anything. My hair just wouldn’t part! By this point, I am really mad. I do not know what is up with my hair today. I finally get it parted and start to roll. Everything is fine until I get the comb rolled into my hair. I mean, the hair was wrapped around the comb. I have no idea how that happened, but at this point, I gently unrolled it, took a breath and finished rolling my hair. I just did not have the strength nor the desire to keep being angry at my hair today! 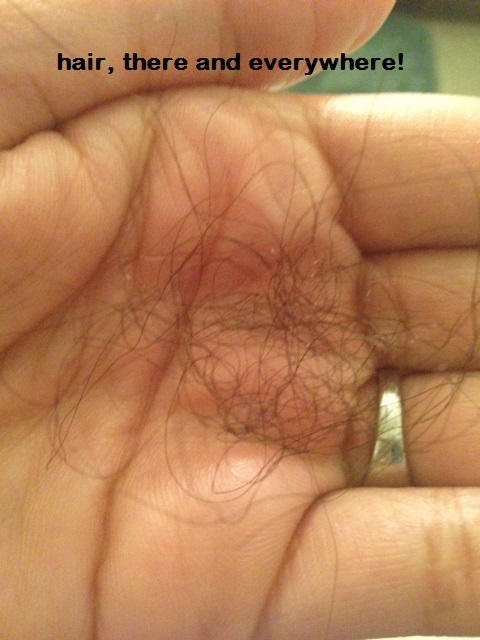 But adding insult to injury, my hair is shedding … A LOT (well, to me, anyways!) I feel like it has gotten thinner! I normally shed a few hairs during the week and a good deal during my Wash Day, but this week, I shed while M&Sing and a lot today. 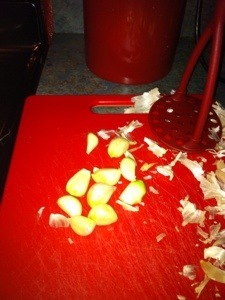 I will be doing my garlic rinse next week! I have been slacking on my water and veggie intake. I have also been drinking too much soda!! Well, here’s to health!! There is still some shedding, as I lost some hairs when I was taking my rollers down and applying the Vitamin E oil. Oh well … I felt like I was swimming in hair today. There was hair (still attached to my head) falling in my face, fallen hair on my arms and shoulders. I just could not wait to be done with Wash Day today. I have enough of my hair today! Now it is crosswrapped and placed under my satin cap, where it shall stay until tomorrow morning. I did manage to take a few pictures. Despite me losing hair, I still have a lot of hair. Sometimes I wonder why my hair doesn’t fall like I want it to and why it’s always so big. It is because there is a lot of it. That’s a blessing, I suppose. I will probably be wearing it up for the most part this week. I am going to Bend tomorrow and it is quite dry there, since its in the desert. It will also be snowing there, so there will be no need for stuntin’! Also, Nathan said that they are calling for 50 mph winds here! HA! My hair will be pinned up tight if it still like this when I return on Wednesday! Here is what my hair will look like if it doesn’t stop shedding! Awww! That sad little tree!